Born on the edge of the Lake District in the small market town of Ulverston, Gordon was brought up visiting the lakes and fells, where he still goes walking, canoeing and sailing to relax. At 18 he became a secretary for the CHA keeping up to 80 people a week happy on guided walks in the highlands of Scotland. At 23 he worked in Taskforce North for the Lake District Planning Board where he soon became supervisor of the team doing ditching, walling and other footpath work. In the late 1980s he helped write walking guides for Clwyd CC in a Walks Around Wrexham series then was given the chance to republish Jack Baker's Walks in Clwyd, which he did by adding nature and historical interest in hand-written small booklets. 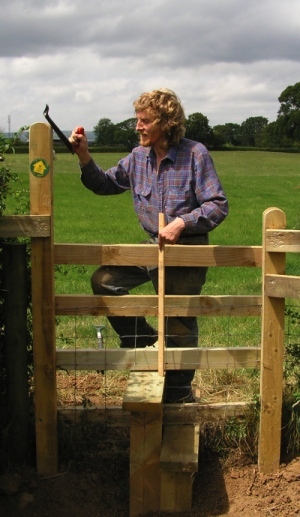 Family Walks guides for Scarthin Books soon followed and also The Guide to the Maelor Way, also hand-written, following a long distance footpath along the Welsh borders on which he installed 60 stiles and signs voluntarily with help from an out-of-work landscape gardener. Wrexham Maelor Borough employed him as their sole footpath contractor as did Groundwork Trust in Wrexham for several years until tendering came in and he became one of four contractors for the counties paths. Meanwhile some of the interesting history and curiosities of Clwyd (Wrexham, Denbighshire and Flintshire) came together in Curious Clwyd, hand-written, with black and white photos by Mike Penney. Then it was Chester's turn and after a year of research Curious Chester, Chester Inside Out and other Chester books were written. But you don’t have to walk to enjoy the various local history guides he publishes. Take a trip into Cheshire’s folklore with Roger Stephens, cruise the Chester Canal, find out about mills with Roy Wilding or see spectacular underground scenes with Cris Ebbs. If you still want to walk many guides are still available including four city walks in Chester Inside Out, and RJA Dutton’s amazing Hidden Highways of Cheshire or Hidden Highways of North Wales. Family Walks in the North Wales Borderlands is out of print as is Death in Chester and Gowy, Source to Sea but Family Walks on the North Wales Coast still available. Thirty five years ago, I moved to Coedpoeth, Wrexham, North Wales and bought 6 pathfinder OS 2 1/2" maps. I decided to walk all the footpaths in Wrexham. On Wednesday I completed the last path. Well, why did it take so long, my son Justin only took 71 days to walk from John O'Groats to Land's End. Well I ended up clearing all the footpaths of obstructions, first I waymarked some then put in 200 stiles including the long distance path - The Maelor Way, then worked for Wrexham county as a footpath contractor, then after retirement continued to report path problems serving legal notices on the council, and even taking them to Magistrates Court. Oh and I also made a path claim which ended up clarifying the law in the High Court and Appeal Court. This has helped other path claims countrywide. The last path I walked was obstructed in 7 places with fences and ditches with no pipes or bridges. The council should clear these obstructions and put in gates and signposts in the next financial year.